If we had a dollar for every time someone suggested we carry Lottie's Hot Pepper Sauce, we would've had enough money to fly to Barbados and bring it back by the case load. But, an importer has saved us the trip and Lottie's is now readily available right here in the USA. Lottie's Bajan-Cajun (red) Hot Pepper Sauce is a delightful combination of habaneros, onions and spices. The True Bajan (yellow) has mustard added for a traditional Caribbean taste. Both sauces are gold medal winners, and both have a nice, slow burn that adds a delicious touch of heat. From Barbados. A great product to make favorite foods taste better. Simply put its the best spicy mustard sauce on the market! the yellow is the best tasting hot sauce I've ever had. If you like more heat get the red. Love this and have been ordering it for years. Brings the heat with FULL FLAVOR. Had to update my 2012 review. This is the best hot sauce on the market. Everyone I have ever shared this with raves about how good it is. Sandwiches, dogs, eggs, it can't be beat. If you like mustard based hot sauces full of flavor and not just heat, give lotties a try. You will be hooked!!! HANDS DOWN THE MOST FLAVORFUL HOT SAUCE I HAVE EVER TRIED!!! THE HEAT LEVEL IS PERFECT TOO!!!! TRY THIS!!! IT'S THE BEST!!!!! Can't live without this stuff. I love Caribbean hot sauce. YUM. This is my go to hot sauce from eggs to chili to burgers & as a pizza sauce!!! My husband first tried this sauce in Barbados 15 years ago, It has been his go to sauce ever since. I order this sauce by the case!! Aug 7, 2016 | By George S.
I discovered this product down in the Caribbean years ago and have been buying it ever since. This is absolutely the best tasting Barbados yellow sauce on the market. Rocks your socks off with heat and flavor! Actually this awesome sauce is not that hot. We used to vacation in Barbados for 20+ years and discovered Spitfire brand. Well, there is no hot sauce in the US that even comes close to compare. I discovered this same recipe and HAD to order more because the really small bottle we have now has only a drop or two left. If you love hot sauces, THIS ONE IS A MUST!!! We used to spend winters in B'dos and first thing at the store, bought a BIG bottle of Spitfire. Lottie's is the next best thing. Our current bottle is almost empty so yeah, we're back for MORE HEAT! Classic! Can't go wrong. Very very good. THIS HOT MUSTARD SAUCE IS THE MOST FLAVORFUL CONDIMENT I HAVE EVER ENJOYED IN MY ENTIRE LIFE!!!!! IT IS JUST EXPLODING WITH WONDERFUL CARIBBEAN FLAVOR AND THE PERFECT AMOUNT OF HEAT, NOT TOO OVER POWERING ON THE HEAT, JUST PERFECT!!! Bajan yellow sauce is one of those rare hot sauces that's not just about heat (tho there's plenty of that) but it brings a unique flavor that enhances just about any dish. Montoya.com makes getting it so easy & they've got great customer service. I order 2 bottles at a time & this time hey also sent a complimentary sirracha sauce i'm looking forward to trying. I buy all my hot sauce I can't find locally here. Quick shipping and great selection. In the event anything goes wrong they will work to fix the issue for you quickly! 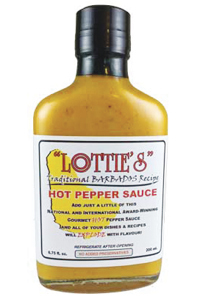 I have been using Lotties hot sauce since I lived in Barbados (1970) 45 years ago.. it is the very best. This is authentic sauce made on Barbados. This sauce or homemade variants are innocently presented on Bajan restaurant tables in little condiment dishes. You can always tell the new tourists because they slather this on their food like it was the sweet British ketchup in the next dish - and then they cough up a lung ;-) Firey hot with secondary flavors of mustard and onion. Excellent when used with caution, especially on pork or mixed into other sauces. Probably heresy but I like this mixed with regular yellow mustard on hot dogs. This hot sauce is excellent. This goes great on a sandwich, hot dogs or hamburgers. Mustard is the first flavor that hits followed by the heat and tang. The mustard flavor is not dominate. A truly delicious hot sauce that packs heat but is all about flavor not punishment (like some that are there simply to test ur ability to deal with pain LOL. The mustard base goes prrfectly with my Latin dishes, as well as West Indian & Asian cuisine, & even on toasted Thomas's English muffins...yeah, it IS a lil bit addictive but ur gonna love it! This Jamaican hot sauce is my all-time favorite!!! Lottie's is still worth every penny but the original , made with Scotch bonnets was much hotter and tasted better. Great taste with a little afterburner! I love this sauce on chicken, pork, eggs and soups. Great tasting heat without hurting anyone. I fell in love with this style of hot sauce while bare-boating in the British Virgin Islands many years ago. Lottie's is the best ever. Some Pusser's rum, then some roast pork with Lottie's.. Your'e gonna luv it!!! Gave as gifts to my spicy friends who love HOT! They LOVED IT! HOT WITH FLAVOR--FANTASTIC! Knew about it because of a restaurant we go to serves it & told us where to get it. A great secret in my area. More will be getting ordered! Tasty and not too hot. Good with chicken. Awesome flavor and awesome kick. The best sauce going! I have been looking for this or windmills pepper sauce since I lived in Barbados 30 years ago. It is as wonderful as I remember, and by far my favorite hot sauce. Awesome sauce. Perfect heat and flavor combo. Hot, but not extreme. Love scotch bonnet. Maybe the perfect pepper. Best overall hot sauce for taste, quality and heat. Lot o flavor without too much heat. Love it! We love the pepper sauce from Barbados! I will definitely order from you again! Great service. Lottie's is wonderful, flavorful, and HOT! I fell in love with this style of hot sauce in the Caribbean and was thrilled to be able to order it here. Lottie's yellow hot sauce is addictive to me. Once I open a bottle, I can't keep from eating it until the whole thing is gone - I have to ration myself. It's the best! And good heat. I really liked this sauce with halibut. This is my favorite hot sauce, great flavor and heat. I can't eat a sandwich without Lotties Yellow! Great on hot dogs and brats, too. This sauce has been around for many years and is excellent with chicken, fish, meat and so on. Good stuff!! How does your rating work? If 1 is the best then I select 1 if 5 is the best then it is 5. The first time I had Lottie's red and yellow hot sauce was in Barbados. I brought a case of each flavor home and simply enjoyed them. I am so glad I can get it once again at Mo Hotta Mo Betta. This is the BEST sauce ever! My favorite - if there were more than five stars I would give them!!!!! Many years ago my husband bought this sauce in St Croix. He and everyone that has tried it, fell in love with it at first tasting. Our refrigerator is never without a bottle in it! Lotties is the BEAST! Best flavor nice heat, goes with anything! Excellent, excellent, excellent! Great mustard flavor, and great pepper heat. I use it on everything. I wish I could buy it by the quart! Lotties is a great sauce on eggs to pizza to salami sandwiches. Great product. What more can I say than it's the best I've ever tasted. I still used other sauces of course. Certain things call for certain flavors, but overall Lottie's is the best taste. I've been out for a while and just got a new shipment. It's every bit as hot and delicious as I remember. One of my favorite sauces. This is an excellent Bajan hot sauce, good on just about anything. i got this sauce from MOH*MOB many years back. this quickly became the topping of choice for cheeseburgers. good burn, fantastic taste, an immaculate sauce. everyone i have introduced it to is now a regular Lottie customer. A+! This is the one hot sauce that my whole family loves to put on everything, from eggs to chili to vegetables to hot dogs. It has a nice heat, but what makes it so fabulous is the delicious, complex flavor that comes through along with the heat. highly recommended! If you're looking for a hot sauce with heat and flavor, the best base pepper is the SBP, and Lottie's is one to try. Ingredients: Habaneros, Mustard, Vinegar, Onions, Sugar, Salt and Garlic.